Ms CRM 2013 Configuring Exchange Syncronization and Known Issues. All this without the need for the CRM Outlook client. 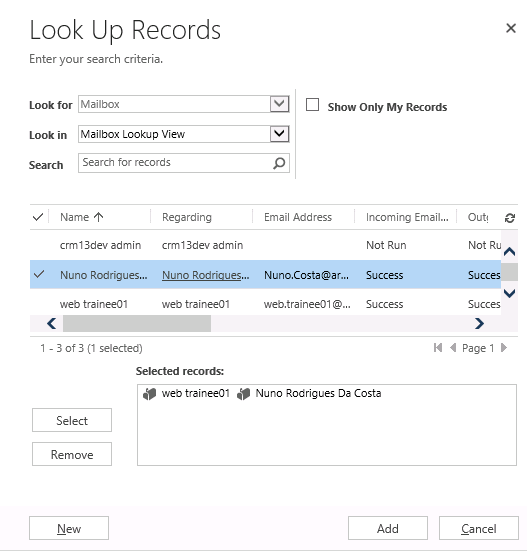 In the past appointments could only be synchronized with the CRM Outlook client installed and configured, if you booked an appointment with multiple people the appointment would only appear in other users Outlook Calendar if those same users had the CRM client installed and synchronizing with CRM. With Exchange Synchronization you eliminate this need for the CRM client, appointments created by you that require multiple people get directly written to their exchange profile so you automatically get an appointment alert to accept or decline. 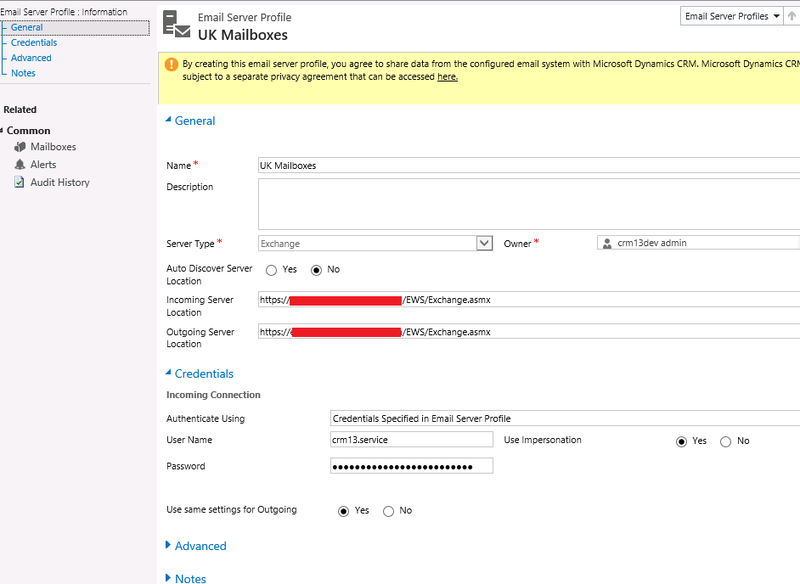 Before we start configuring CRM 2013 with exchange we need to have in-place HTTPS. 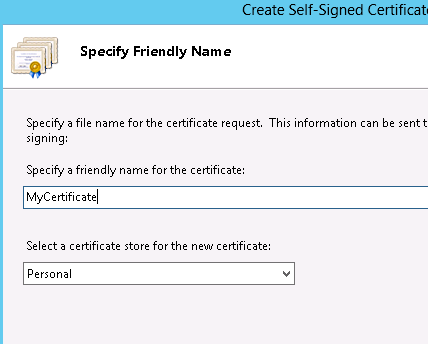 We just need a self-signed certificate generated by IIS to get us going. New-ManagementRoleAssignment -Name "" -Role:ApplicationImpersonation -User ""
The second PowerShell command requires the Distinguished Name (DN) of the Microsoft Client Access Server (CAS). Fill in the details as per the below screenshot, you could use auto-discovery if it's working okay for you, I have tested in my environment and worked perfectly. 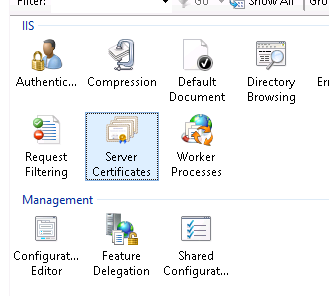 The service account we specified has been given server-wide impersonation. I've named the profile UK Mailboxes if you have users across different countries and exchange servers located on these sites you should create multiple profiles with the corresponding Exchange servers. Navigate to Mailboxes and on the Ribbon choose Add Existing Mailbox, by default every user created or imported during an organization import it's automatically generated a mailbox in the system, so when you click add existing mailbox the system will list all available user accounts. 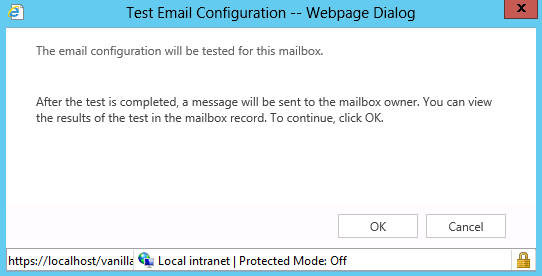 This means all checks completed successfully and you ready to test it in Outlook. 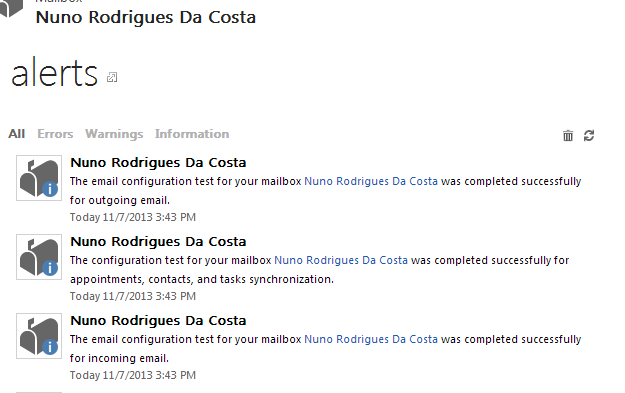 If you look back at the Mailbox General tab you should now see the Configuration test results as Success. This is a test message to check the outgoing email configuration for [User]. Go to the Email Tab, on this section there are a number of important settings that you should think from a design phase rather than implementation. here you define which default method you want to process users email as it says if you choose Server-Side it will block Email Router. As we want to test server-side synchronization choose server-side instead of Email router. This will define users profile preferences and this is very important from a design perspective because will avoid duplicating work. 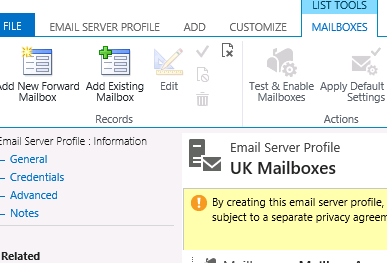 If all your users are in UK you can default a server profile to UK Mailboxes, if you have users across different countries you could still define a default Email Server Profile using auto-discovery and then workout manually any specific users that require a manual Server Profile. On the incoming, outgoing email and appointments, contacts and tasks default this to Server-Side synchronization or Email Router this will make sure it can use both. Below you define if you should only process emails for approved users, this means if email processing is not a sensible subject in your implementation then I would recommend you untick this boxes because it removes an extra click on the configuration steps as we have seen above. Configure email correlation, by default both tracking token and smart matching are enabled this is a business requirements rather than a performance or optimization issue. The tracking token will add a token CRM:Number to the emails subject which get processed by CRM and smart matching will be more transparent to users and attempt to use a matching pattern to find emails that should be tracked in CRM. Note: Using a tracking token will be more efficient than smart matching but at a cost of being less transparent to users. 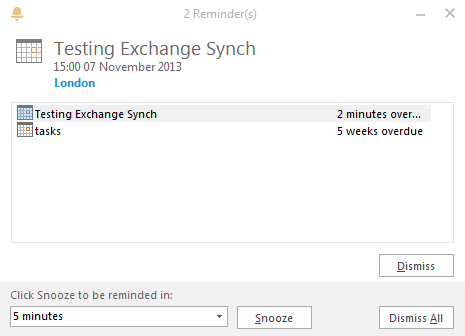 You ready to test the exchange synchronization create one appointment in CRM and include as required yourself and another CRM user fill in the other details and SAVE in a few minutes if all works well a meeting request is received in Outlook by all users. 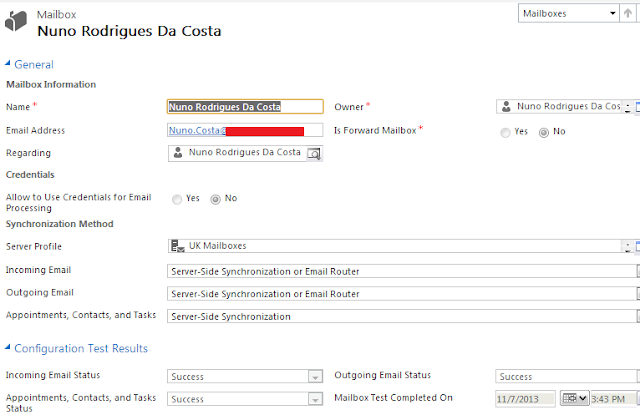 To test sending emails confirm that on the Configure Email processing in the Global email settings is set to server-side synch, send an email to someone from CRM and ask that person to reply back, you should see the email tracked automatically in CRM. On the design overview I just want to share a high-level diagram on the possible design routes for server-side synchronization. 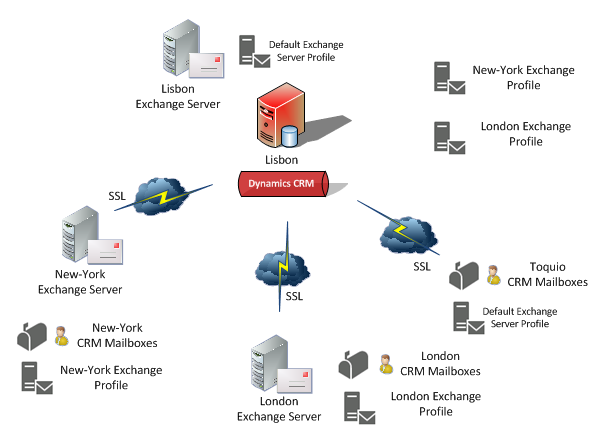 The Default Exchange server profile it's applied to all users mailboxes so you only have to apply manually Exchange profiles on users mailboxes in London and New-York. Toquio and Lisbon will both default to the default Exchange profile which points at Lisbon. While testing the server-side synchronization I found that some mailboxes didn't get processed though the Test configuration results passed successfully. Enabling logging on the Asynchronous servers I found the below error; this has been logged with Microsoft and currently being investigated so if you do find yourself unable to test the server-side synchronization bear in mind this could apply to your mailbox create a new user with a brand new mailbox to test your CRM configuration. 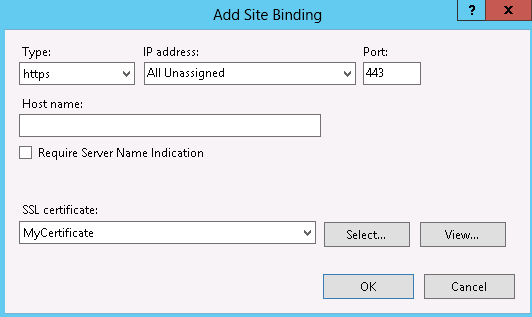 >Exception occurred while retrieving folder data from exchange server. Exception: Unhandled Exception: System.ArgumentNullException: Value cannot be null.